Hopefully all of the posters we used to have on this forum will come back. The Dolphins were given a gift to open the season, a 1 p.m. home game. It is going to be hot, and historically the Dolphins have done well at home in September. The Dolphins must open this season with a win, this is a tough schedule and the only way to have a shot at a winning record is to win at home. The Titans are actually favored by a field goal, which goes to show you how little faith the general public has in the Dolphins. So lets look at some of the factors in this game. The Titans are rolling out a brand new offense, which included new terminology, new routes, etc. It has been reported that Mariota has struggled with the playbook during training camp. If he is still processing the new offense, it will slow down his reads, which should help the Dolphins defense. The Titans also have a bunch of banged up players on their defense. The negatives on the Dolphins side is Parker will miss the game with his broken finger. His replacement will be Grant, so in one way it hurts, but it also makes the offense more explosive. Grant has the catch radius of an ant, but if he gets open, few defenders have the speed to catch him. The Dolphins also have 6 new starting players on defense who are going to be learning how to play as a team. I don't expect a blowout either way. This is going to be a close game. I going to predict Dolphins 23, Titans 21. I think the Dolphins will struggle in the first half and have to settle for 3 field goals. I think the Titans will start of fast with 2 TD's in the first half. 9-14. 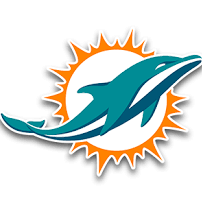 I think the Dolphins defense will get better as the game goes on and only allow 7 points in the second half. The Dolphins offense will also get better as the rust comes off Tannehill, and the Dolphins score 14 points in the second half to win the game. I'm expecting a win. I think the Titans being favored by -2.5 is borderline disrespectful. The Titans have so many factors going against them. 1) rookie HC along with new coordinators 2) more injuries than Miami 3) away game 4) hot weather game at 1pm in dark jerseys. Miami will win if: They get enough explosive offensive plays to force the Titans to pass the ball to play keep up. 3-and-outs need to be minimized, stay in 3rd and manageable, keep Tannehill upright. Let him distribute the balls to the right guys and let the speedy guys (Wilson, Stills, Drake) take short/intermediate passes and turn them to explosive gains. Don't abandon the run game and let Drake do work against the right defensive fronts. Miami will lose if: The Titans pound the rock consistently and successfully. 6/7 minute scoring drives and keeping Tannehill on the bench is the worst way this game can go, and the Titans have the personnel to make it happen. Burke needs to put his secondary in the right position to force turnovers, and hope his DTs and LBs hold up in the run game. My biggest worry in this game is Mariota, Miami seems to always struggle against a mobile QB and with Suh gone he could have a field day running up the middle. If Miami contains Mariota I think they win, if Mariota runs free Titans win. That's probably not the case. Mariota hasn't been a big runner/scrambler in the NFL. Part of that was the way offenses were called with previous OCs, the other part concerns around his durability. He makes big runs when needed, but generally not on the reg. More than likely Miami loses if they can't stop the run. Even with the new offense we are generally built to run and play solid D. Turnovers are going to be key, and Mariota has been a bit conservative this preaseson so lots of Delanie, Dion and short stuff (death by 1,000 cuts over big plays). I think Henry is going to beat us up this game, but if we can limit the amount of turnovers on offense, we will win. Delanie Walker. He's the key to the game for me. If we can find a way to limit his contributions, I'm not all that frightened by that offense. I think they get it done and win 20-17. Bad news on the injury front. Marquis Gray ruptured his Achilles in practice yesterday and was placed on IR. The Dolphins resigned Gavin Escobar to replace him. That leaves rookie Durham Smyth and Escobar as the only inline TE's on the roster. The good news is that Escobar knows the playbook and will be able to step in right away. Why does everyone forget about AJ Derby. He played 20-30 snaps per game over the last month of the season, and is probably a better blocker than Escobar. I expect him to be the #2 TE ahead of Smythe. I haven't forgotten about AJ. He showed some promise last year but he has been banged up all training camp. Gray was expected to be the #2. I don't think that Escobar is going to get allot of playing time to be honest. AJ will get an opportunity to showcase his talent. More important than the 2nd TE is Grant. He is practicing, but he hasn't been cleared to play in the game yet. That is going to hurt us and Wilson or Amendola will replace Parker, and they don't have the same big play potential that Grant has. I don't expect Grant to do allot, but just having him out there forces the defense to cover him, because if you don't, you are going to give up a TD. David Hyde made a comment that the media wasn't allowed to discuss allot of the formations and plays during training camp, but he said that Grant and Tannehill have a "connection" I think he was saying that they have been throwing the ball deep to Grant more than in years past. I feel good about this game. I can see us winning a tight ugly game and then dropping the ball against the Jets. It's the Dolphins thing to do. What???? A 98 yard TD drive???? Most Impressive. I hope to see more offensive execution like that.